21:40 – GAME OVER. Your BelPot Final will be between Boston Univeristy and Union College as BU come from 2-1 down to defeat UConn 3-2. 21:10 – TV Break… check out Joel Neill’s intervier with BU Athletics Director, Drew Marrochello. 20:40 – End of the 2nd, its 2-2. 20:35 – Less than 2mins to go in the 2nd. Game still level and its a belter. 20:10 – 14mins remain in the 2nd and the physicality is ramped up. Curry takes a big hit as the game goes end to end. 20:00 – Second Period is Underway! 19:42 – END OF FIRST, The Huskies lead at the break. 2-1. 19:38 – GOAL!! The Huskies lead again, with 2 mins left in the period the Predators draft pick Klondelik gets UConn’s second of the game. 19:32 – It’s 1-1, on the Powerplay, Patrick Curry levels it with just over 5 mins left in the period. 19:30 – There are some serious internet problems at the SSE Arena at the minute, however wecan tell you that it’s 1-0 to UConn Huskies, El-Mir on the board after 5 minutes. 17:45- The teams split the points as OT comes to an end. Both teams will now head to a shootout to determine tomorrow’s Belpot finalist. 17:42- this is end to end with 1.20 left in OT. 17:39- Union Goaltender Darion Hanson covers up the puck after Yale #9 Robbie Demontis finds his way through on goal on the breakaway. 17:35- OT underway. Yale tendy Corbin Kaczperski SHUTS THE 5 HOLE on a breakaway effort. 17:25- TV Timeout with 2:37 left in the game. 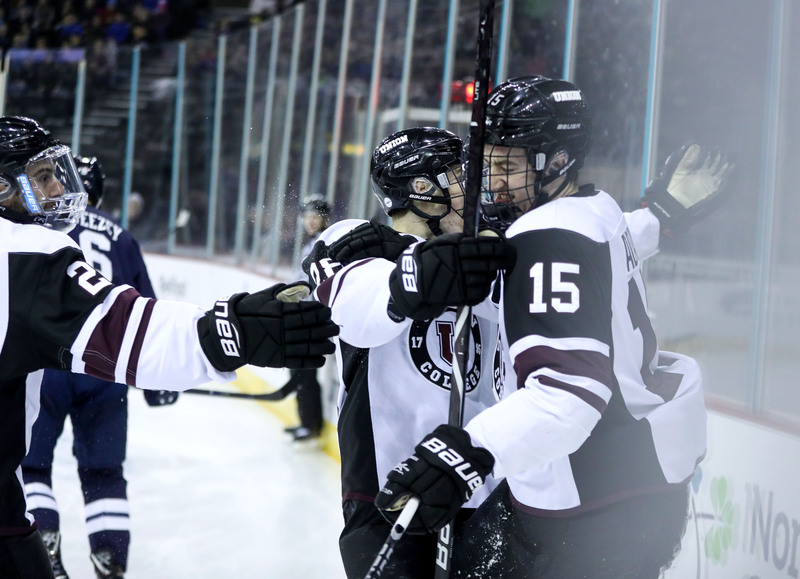 The Union Dutchmen had been pressing high in the moments leading up to the stoppage, their first meaningful offense of the final period… this game could still go either way. 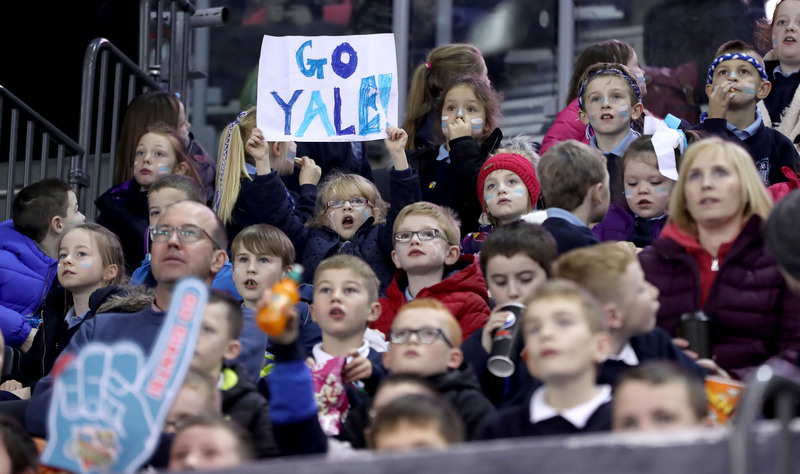 17:15- GOAAAAL Yale! They sure can! The Bulldogs score courtesy of Charlie Curti, unassisted at 51.32. 1-1 hockey game with 7.51 left. 17:13- Dutchmen take a kneeing penalty with 9.04 left in the game. 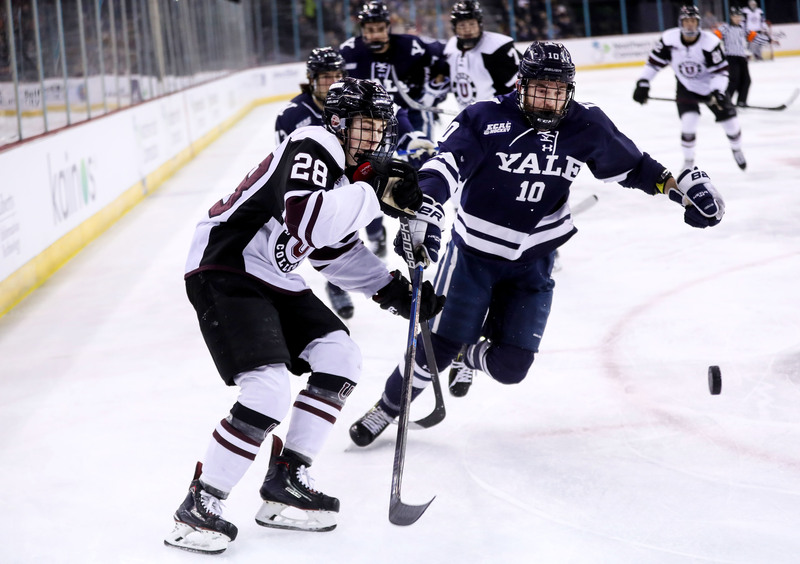 Can Yale pull of the late goal? 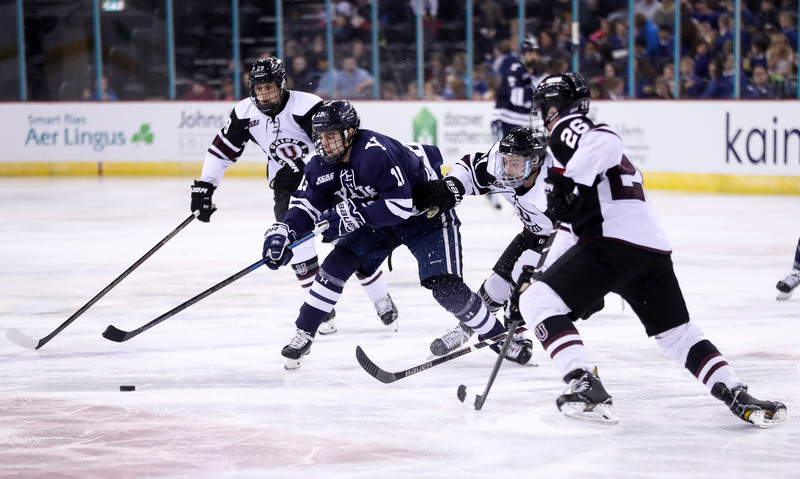 16:52- the third and final period is underway with the Yale Bulldogs pressing high on the Union Dutchmen. Yale are a team who have had their chances throughout this game, but honestly haven’t taken them very well. Between that and Union’s ability to smother attacks at the blueline, it’s made for a frustrating afternoon for the Bulldogs. The Dutchmen, on the other hand, will have frustrations of their own as they have failed to open up a lead in this game. 17 minutes left! 16.32- It is Union 1-0 Yale after 2. Despite the tight scoreline, Union’s defensemen are making it look tough for Yale to find a way back into this game. Will the Bulldogs figure it out in the final period? 16:29- It took until the dying minutes of the second period for Union to take a penalty- but the Yale Bulldogs are unable to set up in the zone or capitalise on the opportunity. Full strength hockey as we enter the final minute. 16:15- As Union absorb an extended period of Yale pressure the majority of the conversation in the media box is about their shutdown D so far this game- smothering the Bulldogs as soon as they cross the blue line and willingly downing bodies in the slot when needed. You get the sense, however, that Yale are beginning to figure this team out. 16:06- Union are once again on the powerplay following a slashing call on Yale #7 Joe Snively. 16:01- The second period is underway and both teams have come out of the traps FULL of energy. End to end hockey. 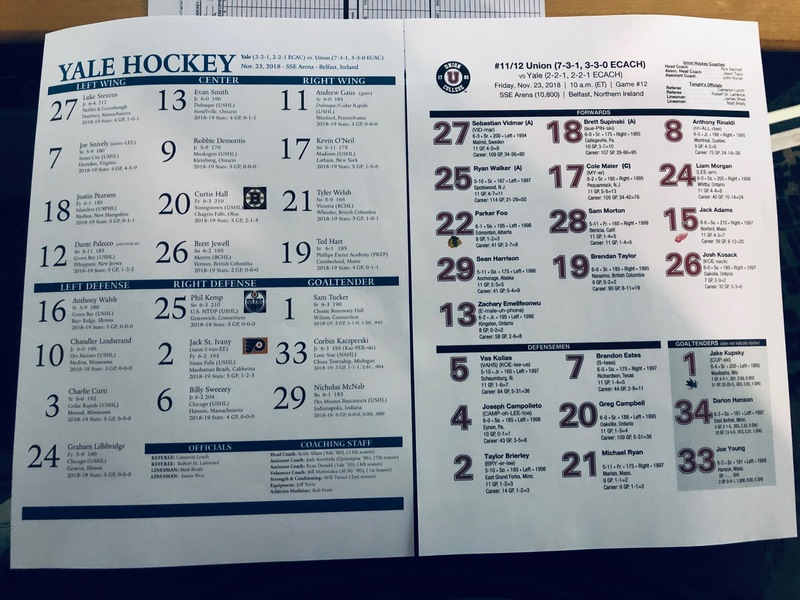 15:30- Let’s take a look at the team sheets for game 1 of this 2018 Friendship Four between the Yale Bulldogs and the Union College Dutchmen. 15:27- 6 minutes left in a fast paced first period- Yale probably slightly edging the balance on offense, however Union College’s D are doing a fantastic job of smothering them in the offensive zone. 15:18- We have our first penalty of the day as Bulldogs defenseman Phil Kemp sits for tripping. The atmosphere is electric for such an early game on a Friday. Helped in no small part by huge groups of school kids who have been visited by these two teams throughout their week in Belfast. 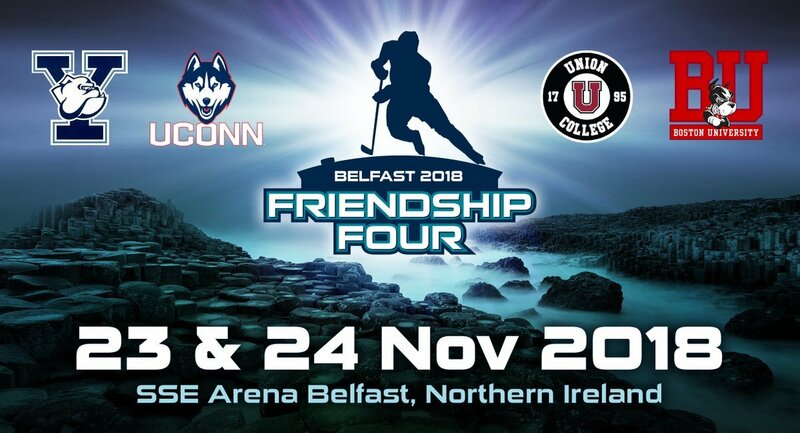 14:46- Welcome to our LIVE coverage of the fourth annual Friendship Four- pitting some of the NCAA’s finest D1 hockey programs against each other not only for league standings back home, but for bragging rights and the honour of lifting the beautiful ‘BelPot’ school bell. The arena is filling up and we are just moments away from New York’s Union College Dutchmen and Connecticut’s Yale Bulldogs taking to the ice for game one. Keep it right here for all the action!